More manufacturers need to learn from the TC Electronic Ditto Looper. This loop pedal is an incredible device that gives you only the necessary features. No extra effects, no tone coloring, just plain ol’ looping. And it does the looping very well at a great price. First things first, don’t dismiss this pedal because it doesn’t have dozens of buttons and knobs. You can accomplish some amazing things with the Ditto Looper if you take the time to learn how to use it. Up to 5 minutes of looping time. One button and one knob. Ability to undo and redo layers. Its small size saves room on your pedalboard. Ability to install software updates via USB. A nifty TC Electronic sticker. To power up the pedal, all you need to do it plug it in with 9 Volt DC (center negative) power supply which is, unfortunately, not included. To record a sample loop, tap the footswitch once. To switch to playback, tap the footswitch again. To undo or redo your last loop, press and hold the footswitch. To stop the loop, double tap the footswitch. To stop the loop and delete it, double tap and hold the footswitch. To resume playback, tap the footswitch. Press and hold the footswitch while the pedal is disengaged. 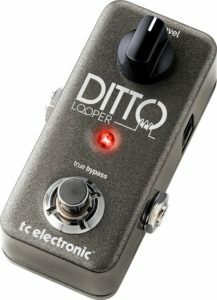 The Ditto Looper should most likely be placed at the very end of your effects chain. To start recording a loop, press the footswitch once, and the LED will turn red, showing that the device is recording. At the end of your loop, press the switch again, and the LED will turn green. When the loop starts over, the LED will blink, to show you’ve returned to the top. Press the footswitch again to overdub another loop, and when that loop is complete, tap the footswitch again, and the Ditto Looper will continue to playback both loops. Note that you can only undo the last loop. To undo the last loop, hold the footswitch for at least 1.5 seconds. To redo an undid loop, hold the footswitch again for at least 1.5 seconds. Undoing and Redoing can be used for more than just removing mistakes. If you’re creative you can use this feature to enhance your tune. For example, if you’ve laid down your bass and rhythm parts, you can record a melody, undo the melody, record a solo, then redo the melody. To stop playback and delete everything, press the footswitch twice quickly, but hold the switch down on the second press. You’ll now be able to start over fresh. The first impression I got from this device is how compact it is. It measures 1.9 inches wide, 1.9 inches tall, and 3.7 inches long. It takes a standard 1/4 inch mono jack as it input, and its output. I was disappointed to see it did not come with a power supply, and no place to put a battery, but this power supply worked perfectly. Once I got a hang of the controls, it worked great. However, most sure you read the instructions well before you try to do anything serious with it. I decided to dive right in with the manual in front of me, and that was a mistake. Once I got into a groove, I found it hard to remember how and when I was supposed to be tapping. Also, while it is possible to undo your last loop, you can only undo your last loop. Although it was mildly frustrating in the beginning, I am now used to it. Another thing to remember is that the length of your first loop sets the length of your subsequent loops. What I mean by this is, if you record a 4 bar loop first, then try to record a 8 bar loop, it won’t work. You need to record your first loop at least as long as your subsequent loops. I was surprised to see a USB input on the side. It’s used to insert a Mini-B USB cable to your computer to install firmware updates, which can be downloaded here. A few negatives aside, this pedal does everything I need it to. One switch is all this is needed to control the Ditto Looper, and one knob controls your playback volume. It also works with bass, and with a multi effects pedal (put it after the effects signal). If you’re looking for a little more out of your looper, you can upgrade to the TC Electronic Ditto X2 Looper or the TC Electronic Ditto X4 Looper, but honestly, this pedal does everything I need it to. With unlimited overdubs, 5 minutes of loop length, and the ability to store your last loop, It fulfills all of my needs.